Activyl is a monthly spot-on flea treatment that works like no other flea product on the market. Activyl works by using a method called bioactivation, a method in which the active ingredient, indoxacarb is fully activated by using the flea's own enzymes. 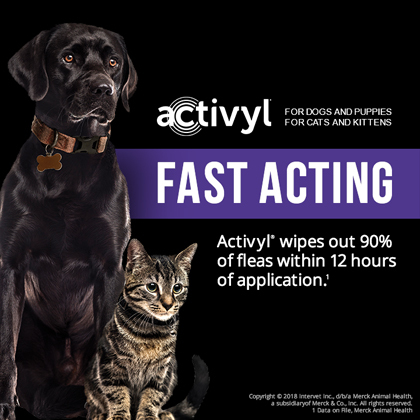 Activyl can be used for both dogs and cats. It kills not only adult fleas but also flea eggs and larvae, thereby breaking the flea lifecycle. For dogs only, use Scalibor to protect against fleas and ticks for up to 6 months.For heartworm protection, try Ivermectin Pyrantel - Generic to Heartgard Plus. 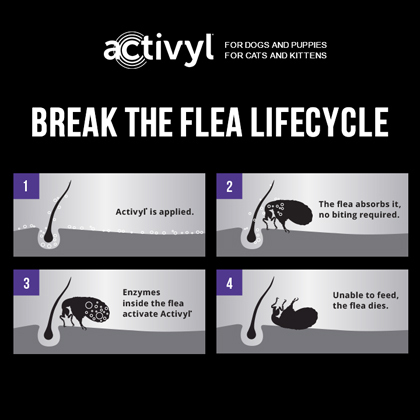 Activyl works to break the flea lifecycle by killing not only adult fleas, but also flea eggs and larvae, which reduces the chances of your pet becoming reinfested. Activyl is spread through your pet's skin and coat. When a flea lands on your pet, it takes up the active ingredient of Activyl and causes the enzymes in the flea to change. Activyl then reaches its full active form and the flea becomes paralyzed and unable to feed. This process is called bioactivation - the newest technology in flea control. In addition, Activyl is waterproof, quick-drying, and fragrance free. What is the most important thing I should know about Activyl? 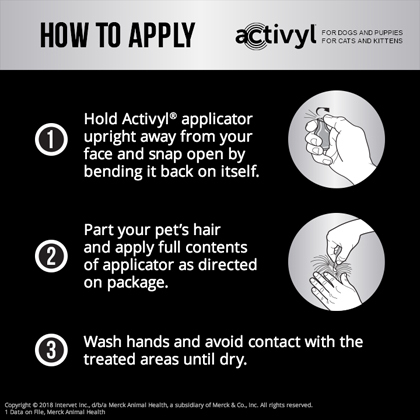 Activyl is a monthly spot-on flea treatment that works like no other flea product on the market. Activyl works by a method called bioactivation. This method uses the flea's own enzymes to change Activyl into its fully active form. It kills not only adult fleas, but it also kills eggs and larvae too; thereby, breaking the flea's lifecycle. Activyl is a non-prescription (OTC) product. What should I discuss with my veterinarian before giving Activyl to my pet? Consult your vet before using on debilitated, aged, or medicated dogs. Certain medications can interact with pesticides. If signs of sensitivity occur, contact your veterinarian immediately. How should Activyl be applied? 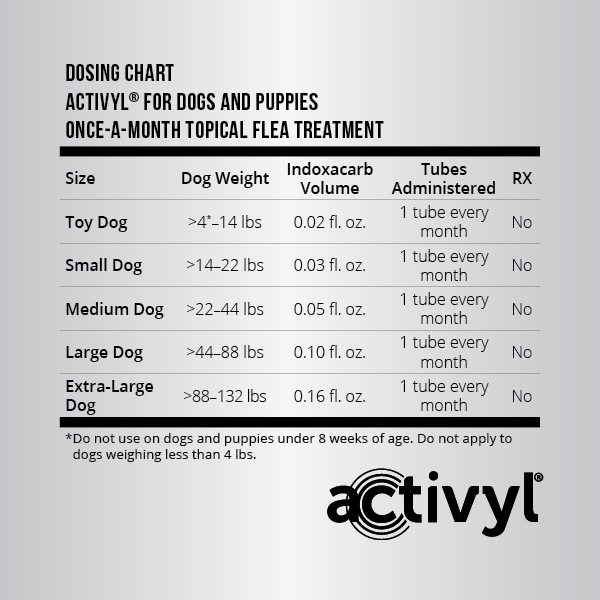 Use Activyl on dogs and puppies 8 weeks of age or older. It is available as 0.51 ml applicators for dogs 4.1-14 lbs, 0.77 ml applicators for dogs 14.1-22 lbs, 1.54 ml applicators for dogs 22.1-44 lbs, 3.08 ml applicators for dogs 44.1-88 lbs and 4.62 ml applicators for dogs 88.1-132 lbs. It is also available for cats 2-9 lbs in 0.51 ml applicators and cats over 9 lbs in 1.03 ml applicators. It lasts for a full 30 days. 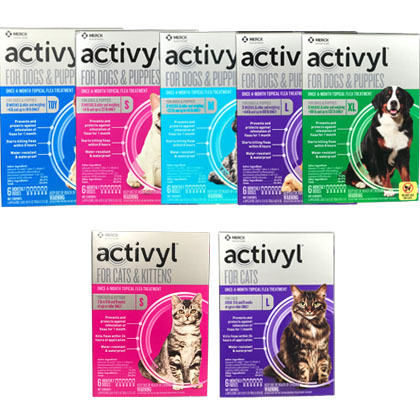 DO NOT USE ACTIVYL FOR DOGS ON CATS. 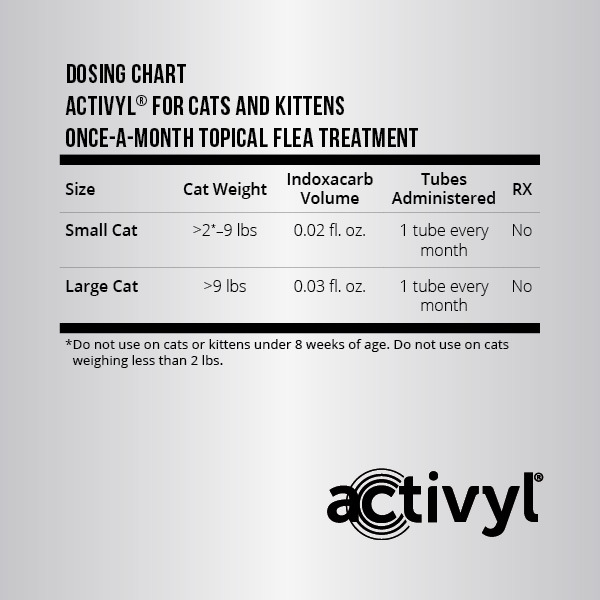 For cats, use only Activyl specifically formulated for cats and kittens. What are the potential side effects of Activyl? What happens if I miss giving a dose of Activyl? Apply the missed dose as soon as you remember. However, if is almost time for the next regularly scheduled dose, skip the missed dose and apply the next one as directed. Do not apply a double dose of the medication. What happens if I overdose my pet on Activyl? What should I avoid while giving Activyl to my pet? Do not use on pregnant or lactating females. Do not use on puppies or kittens under 8 weeks of age. Use the entire contents on each cat or dog and do not split one tube between pets. Weigh your dog to ensure you are applying the right dose formulated for the weight of your dog. Causes eye irritation. Avoid contact with skin, eyes, or clothing. Wash hands thoroughly with soap and water after handling and before eating, drinking, chewing gum, using tobacco, or using the toilet. If swallowed: Call a physician or poison control center or a doctor for treatment advice. Drink 1 or 2 glasses of water and do not induce vomiting unless told to by poison control center. Do not give anything by mouth to an unconscious person. If in eyes: Hold eyes open and rinse slowly and gently with water for 15-20 minutes. Remove contact lenses, if present, after the first 5 minutes, continue rinsing. Call a physician or poison control center or a doctor for treatment advice. If on skin: Wash thoroughly with plenty of soap and water. Get medical attention if irritation persists. What other drugs will affect Activyl? Certain medications can interact with pesticides. Consult a veterinarian before using on medicated pets. Do not remove tube from pack until ready to use. Store in a cool (below 77°F) dry place inaccessible to children and pets. Do not refrigerate and protect from direct sunlight.